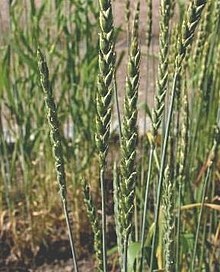 Spelt (Triticum spelta) was an important wheat species in Europe from the Bronze Age to Roman times. It now survives as a relict crop in Central Europe, but has found a new market as a health food. There are often claims made that spelt is suitable for people on a gluten-free diet, but this is incorrect. It may, however, be suitable for some people with an allergy to wheat, although this is very dependent on the individual. This page was last edited on 12 May 2010, at 21:46.